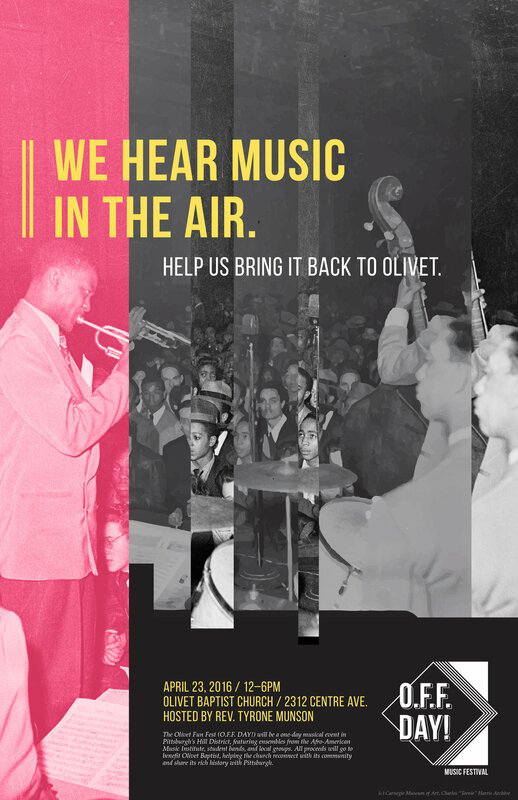 Bringing history, jazz, and a lost culture back to Pittsburgh. The Olivet Baptist Church of Pittsburgh's Hill District was once a musical hotspot in a bustling culture hub. 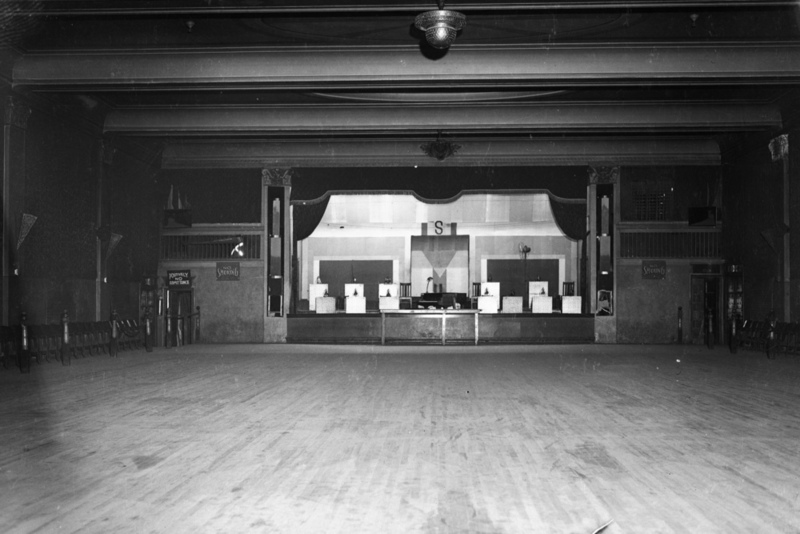 Before housing the Church, this particular building served as the Elmore Theatre and Savoy Ballroom for several decades. However, after years of neglect and flying under the radar, the building has lost its grandeur and its rightful spot as a historic landmark in the city. Inspired by the building’s history, we saw an opportunity for the Church to reconnect with both its past and its community, through a one-day musical event that promotes Olivet and its rich neighborhood. Harkening back to the rich jazz roots of the area, we were honored to host local jazz legends, bands, and choirs from the community. Musicians from CMU came to perform as well, allowing them to see a new side to Pittsburgh's community. Various Pittsburgh goods were auctioned off to raise additional funds for the Church. Items ranged from photo prints of the Hill District (shot and signed by photographer Dylan Vitone), to a signed Pittsburgh Penguins helmet (donated by the Penguins themselves). This triptych set of posters was showcased at the event, placed nearby the entrance as an introduction to O.F.F. DAY! 's theme and purpose. Each poster breaks down the 3 past lives of the building, highlighting moments that made each memorable. Viewers can start from either end—the story was written to be coherent from either side. Created as promotional material. These were distributed around CMU campus, as well as various spots in Pittsburgh. 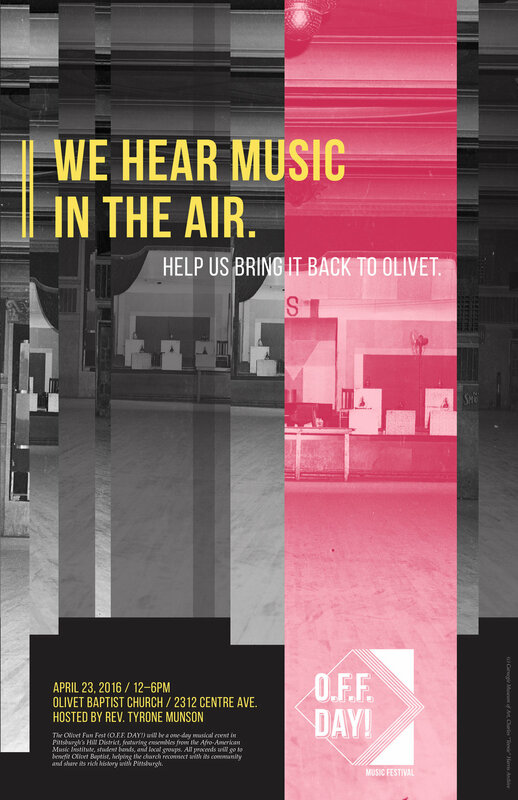 Photos of Olivet during its ballroom + music hall days are cut apart then collaged, implicating "piecing history back together in a new way," as well as to mimic sound waves. Hotspots to several big-name jazz musicians (Ma Rainey, Ella Fitzgerald, Duke Ellington...you name it); it's also where many Pittsburgh-based jazz artists started their performing careers. "Afro-Americans could come in…when they were not allowed Downtown…it was someplace to come and entertain themselves and to have a socialization." Unfortunately, the structure has since been tucked away in drop ceilings and wooden panels, becoming further neglected and unrecognizable. The church's lack of constituency also parallels its lack of consistent funding, which prevents the building's current owner from properly renovating and maintaining its structures. In order to ground the building as a prominent figure in the Hill + Pittsburgh in both the present and future was to spread awareness as well as raise funding/revenue. For more details on how this event came to be + the thinking that went behind every aspect of it, please visit our process blog—I'm happy to chat about it too! The motive of the site was to reach those outside of our individual social circles (who had the capabilities to help push the event forward), and provide them a way to access our story and vision. The site served as an education piece to the building's history, and awareness to its current state as well as the event. I thought it'd be best to design the site to be "infinite scroll," for minimal interference in educating the viewer, and give each section its own full-bleed background to make it clear when each “chapter” of the site (in correspondence to the “chapters” of the building’s story) is concluded. At the end of the site, we included a section that introduces the event, our vision, and links to the GoFundMe page (where we were collecting initial budget). This was a way to tie the history back to our initiative, and how we were inspired to design this sort of solution by its richness. For more details on how this event came to be + the thinking that went behind every aspect of it, please visit our process blog or drop me a line. Hi, I’m Zii. I design because I strive to better understand the human mind, and to apply these considerations to what (and how) we experience.